What if I was cheated? Digitsell - affiliate online store, where you can see digital goods posted by sellers on the Plati trading floor. Plati is a marketplace that directly connects sellers and buyers (Plati). Plati accepts payments for sellers’ products on the basis of a previously signed agreement. Plati is not an acting party in your dealing with the seller and assumes no responsibility for losses and/or damages that may incur should either of the parties default on its obligations. Plati does not get involved in your deals, but only provides a convenient interface for them. Plati cannot guarantee 100% reliability of a seller, although it has been making its best for the past 10 years to ensure fair trade in the system. Plati cannot guarantee the quality of products sold on the site, and is only responsible for their timely delivery after receiving the payment. First of all, you must understand that you are buying an electronic product and you cannot touch and hold it before making a purchase. As practice shows, most misunderstandings during online shopping occur because buyers do not take their time to read the product description, as well as the terms of sale and delivery. Therefore, don’t rush; spend a few minutes to study the information about the product you are purchasing and its seller. Study the product description page (figure 1) and make sure that’s what you need. All product descriptions are provided by sellers. The description 1 must make it clear what product you will get after the purchase. Should you have any questions or doubts, do contact the seller for clarifications, since it is the seller who has complete information about the product. By the way, reaction time and completeness of replies can say a lot about the seller. Pay attention to the quantity of items sold 2 and the number of product returns 3. If there are positive or negative reviews 4, make sure to read them. Note the seller’s comments to them. 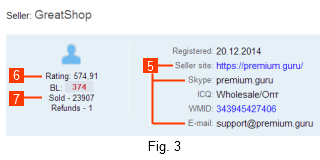 Visit the seller’s information page (figure 3). Note the seller’s registration date. Note the amount of contact details provided by the seller 5. Attention! This information is provided by the seller and is not controlled by the administration of the marketplace. If the seller has a WM certificate, the seller’s page will feature a corresponding logo (figure 4).This means that the WebMoney Transfer (WM) Passport Center stores verified or notarized passport details of the seller. If there is a logo, click on it to see the seller’s information. Pay attention to the seller’s rating 6. The rating is the key indicator of a seller’s reputation in our marketplace. The rating is based solely on buyers’ reviews – that is, users who have actually made purchases. A positive review increases the sellers’s rating by value of (Purchase Price / 100). Negative review decreases rating by value of (Purchase Price / 10). In product listings, ratings are displayed next to sellers’ nicknames. Check the seller’s total number of orders 7. A large number of sales and a high rating are a sign of the seller’s reliability and good record in our service. Most sellers are users of the WM system. Take your time and read WM reviews and WM reports submitted by other members of the system. Please note that there is a special type of products on our site that you may come across – the so-called "game money" for various online games. In most situations, once the payment is completed, you will get a unique code that you will provide (along with your game credentials) to the seller in exchange for the product in the description. Please be careful when purchasing such products, since the actual transfer of game money is carried out outside our marketplace and we cannot control the delivery process. Preorders are another type of purchases that requires extra caution. We recommend placing preorders only with sellers that you know and trust (have purchased from in the past several times) and are confident in their honesty. To pay for an order, you need to select a payment method on the item page and click the "Buy" button. You will be forwarded to oplata.info gateway, where you can complete the payment by following detailed instructions. Plati mostly uses WebMoney Transfer to accept payments from users, which enables us to deliver products to buyers immediately. If it’s a program or a book, you will get a download link immediately after payment. If it’s a prepaid card, we will provide its details (serial number, PIN code, etc.) or a scan. I am not registered in WebMoney, is there an easy way to do that? Registration in WebMoney Transfer will take under 3 minutes. For more information about ways of top-up of your WebMoney purse, please click here. Can I pay via Bitcoin? If the seller accepts Bitcoin payments, you will see a corresponding option in the payment form on the product description page. Select this option and click the "Buy" button. I have a credit card, can I use it to make a payment? If the seller accepts credit card payments, select a corresponding option in the payment form on the product description page. Select "Credit card", click "Buy" and follow the instructions. If the seller accepts PayPal payments, you will see a corresponding option in the payment form on the product description page. Select this option and click the "Buy" button. I am using another payment system (QIWI, Yandex.Money, etc). Select the type of your electronic currency from the dropdown list of payment methods. Click "Buy" and follow the instructions attentively. No problem: select your carrier in the dropdown list of the "Pay with" menu, click the "Buy" button and follow the instructions. I want to use my online banking system (Alfa-Click, Sberbank, etc.) for payment, is it possible? Yes, select "Online banking" from the list of payment methods, click "Buy" and follow the instuctions attentively. Plati is a marketplace with instant product delivery. You get access to purchased products immediately after making the payment – you will not have to wait a minute to start using your product. If you purchased a book or a program, you will get a download link, if you purchased a prepaid card, you will receive its details (number, PIN code) or its scanned image, etc. If there is a technical issue during payment or product delivery, and funds are withdrawn from your electronic purse (account, card), you will be able to access your purchased products in the "My Purchases" section at any time. 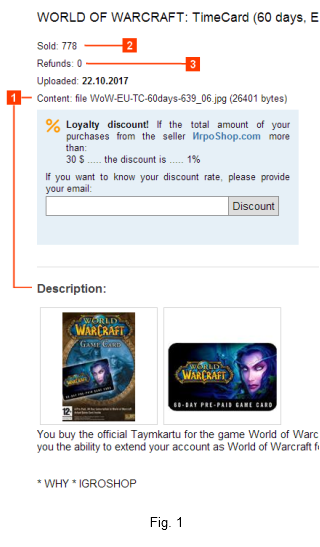 You can quickly jump to this section of our site using a My Purchases link in the top of the page. Our marketplace allows you to post and edit feedback about each product you purchase here. To do that, go to the My Purchases section, select a payment method, sign in and click the necessary product in the list of your purchases. As stated above, reviews affect sellers’ ratings. Besides, a negative review (a "bad" rating) temporarily blocks the seller who does not have a WebMoney Personal Passport. Please note that negative reviews can be left only within 60 days from the date of purchase. First of all, don’t panic. As practice shows, users mostly suffer from misunderstanding, not actual fraud. Such issues take place because buyers don’t read sellers’ terms of sale or product descriptions, or because sellers don’t provide detailed descriptions of their products and the ways of purchasing them. First and foremost, read the product description and terms of sale. If the situation was caused by the lack of attention on your end, contact the seller and explain your position to tackle the problem peacefully. In most situations, sellers agree to help. 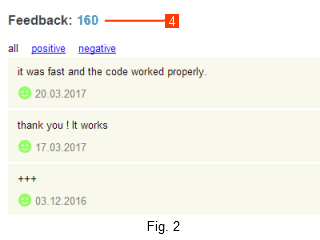 If you believe that a product you purchased does not fit the initial description, you must leave a negative review about the product. To do that, go to My Purchases section, sign in, select the necessary product and leave a "bad" rating. If the seller does not post a comment to your review within 24 hours or doesn’t contact you, please contact the administrator of the marketplace specifying the invoice number. If the seller is not identified via a personal WebMoney Transfer certificate, all of their published products will be blocked. Besides, the seller will receive a notification asking to contact you. If the allegedly dishonest seller does not provide us with information about his personal passport within 30 days, the service administration will refund your money less the standard commission (0.5%). If the seller owns a personal WebMoney Transfer certificate, all questions related to refunds are resolved by buyer/seller negotiations within disputes on negative reviews, and, if necessary, by taking them to the WebMoney Arbitrage service. Attention! Refunds are only possible to a WM purse or a phone account of Russian mobile operators, regardless of the original payment method. If necessary, register in WebMoney. All additional expenses related to the conversion of electronic currencies are not compensated. The only exception is the refund for purchases made via the PayPal payment system – such returns are made within PayPal in accordance with the terms and conditions of PayPal’s end user agreement (Paragraph "PayPal’s Purchase Protection Program"). Use private messaging in My Purchases to contact the seller and try to solve the problem. If you fail to solve the problem peacefully, and you are going to sue the seller, Plati will act as a witness of your deal and will provide full information about the seller and the deal in question.